Last modified on Wednesday, September 24 2008. 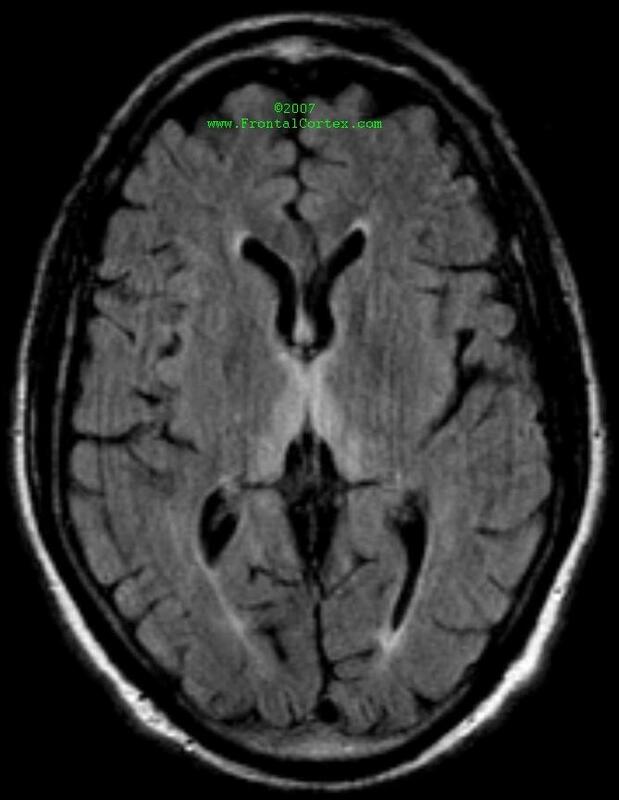 A 56 year-old man presents with worsening ophthalmoparesis, ataxia, confusion, and nystagmus. An MRI of his brain is obtained, and is shown above. Appropriate treatment requires IV administration of which of following? This question was created on September 24, 2008 by jdmiles. This question was last modified on September 24, 2008. 2. Rowland, L.P. (Ed) (2000). Merritt's Neurology, 10th Edition. Lippincott Williams & Wilkins, Philadelphia. 3. So, Y.T., and Simon, R.P. (2004). Deficiency diseases of the nervous system. In Bradley, W.G., Daroff, R.B., Fenichel, G.M., and Jankovic, J. (Eds.). Neurology in Clinical Practice, Fourth Edition. Butterworth Heinemann, Philadelphia, pp. 1693-1708.